Gibson J-200 Elite Model Flat Top Acoustic Guitar (1998), made in Bozeman, Montana, serial # 93178005, natural lacquer finish, flame maple back and sides, spruce top; maple neck with rosewood fingerboard, original black tolex hard shell case. The Custom Shop "Elite" version of Gibson's iconic J-200 has a bit more flash than the standard model, which is already a pretty fancy guitar. The upgrades include green/pink abalone inlay on the ebony fingerboard and bridge instead of white pearl in rosewood, top-grade flame maple for the back and sides, and a tight grained spruce top with a lot of cross-grain figure. It also mounts gold-plated Grover Imperial tuning pegs in a nice nod to its original pre-war J-200 ancestors. 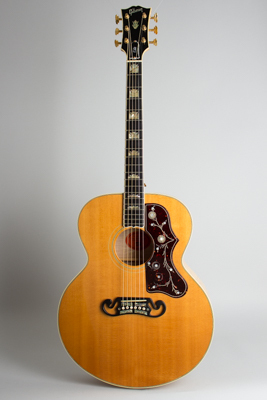 This gleaming natural-finish Bozeman, Montana-built guitar is definitely on the finer end of Gibson's acoustic offerings from this period, and an excellent sounding and playing iteration of the "King of the flat-tops" as the company used to call it. Overall length is 42 in. (106.7 cm. ), 17 in. (43.2 cm.) wide at lower bout, and 4 3/4 in. (12.1 cm.) in depth at side, taken at the end block. Scale length is 25 1/2 in. (648 mm.). Width of nut is 1 11/16 in. (43 mm.). A very clean guitar overall showing some very light wear and no alterations. There is a small grain crack repair to the top just off each side of the fingerboard, well-cleated from below but visible from the top. The pickguard shows some light wearing away to the decorative elements near the bridge from contact with the player's hand. The first fret has a small spot of wear under the "B" string, otherwise the instrument shows very little play wear. A very nice modern deluxe J-200, an excellent playing and sounding instrument complete in the original HSC. Excellent Condition.